Police routinely treat anyone seen taking pictures in public as potential terrorists, officers have told photography students during special police-led workshops. Thirty-nine commercial photography students at Cleveland College of Art & Design have taken part in training sessions after tutors themselves fell victim to police stops. ?They [students] have been looking into the way criminals recce areas using photography, video footage and note-making,? said a college spokesman. ?Police officers are encouraged to approach anyone seen taking photographs or making notes as an effective and proportionate way to prevent and detect serious crime and terrorism.? Police say that the workshops were also designed to help students spot suspects by reporting people behaving suspiciously. 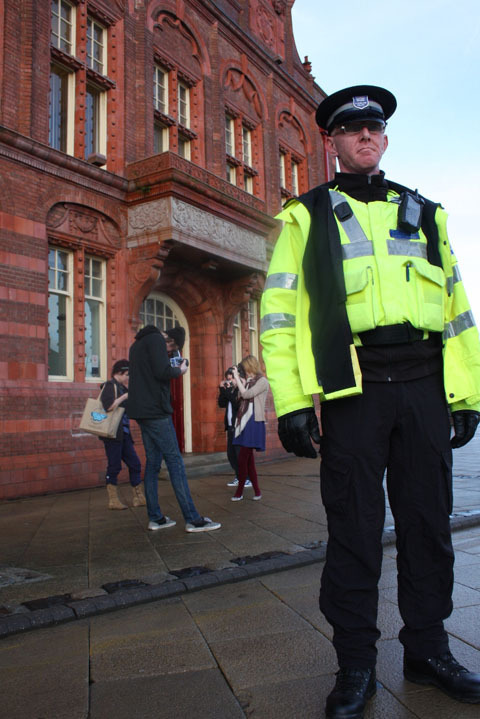 Simon Thompson, a Police Community Support Officer, told the college: ?The aim of the workshop is to raise understanding and educate students about why photographers are stopped and how police officers are encouraged to engage with people who are taking pictures in public places.? He added: ?We are also appealing to students to help us? by reporting any suspicious behaviour.? Commenting on the training sessions, which were held last month, course tutor Richard Whitehead said: ?We are delighted to be working with the police in such a fascinating and important area. ?We have been given first-hand information on how our students can conduct their work professionally as photographers in this new world we all live in.? College principal Martin Raby said: ?Unfortunately, terrorism is not necessarily just a remote problem that affects somebody else. ?These police workshops are giving our students a welcome insight into the issues that affect our daily routine and about the difficulties everyone faces in the current political world. ?It is vital that they know how to work professionally within the system and assume the wider responsibilities of good citizenship.? Two years ago a man was stopped while taking harmless photographs of boats in Cleveland. The case sparked accusations that police had been heavy-handed. Local boat spotter Leslie Cheyne was stopped while taking photos in Redcar. Cheyne, from Sedgefield, County Durham told The Northern Echo: ‘I phoned the police to complain and they said ?for all we know you could be Bin Laden’s brother?’. At the time Cleveland Police told Amateur Photographer that potential terrorist targets include iconic sites, chemical plants, the national infrastructure, aviation and crowded places. However, they admitted that ‘the vast majority of people who are approached will be doing nothing wrong’. Cleveland Police had yet to respond to our request for comment about the student workshops at the time of writing.